This is the enemy – Colditz Castle. Tall, grey, forbidding, it rises from atop the cliff face, an impregnable fortress. During World War I, Colditz was a prisoner-of-war camp from which no-one-escaped. This is World War II. Play as either the allied prisoners of war, gathering equipment and planning your escape, or as German prison guards, with absolute authority but limited numbers. 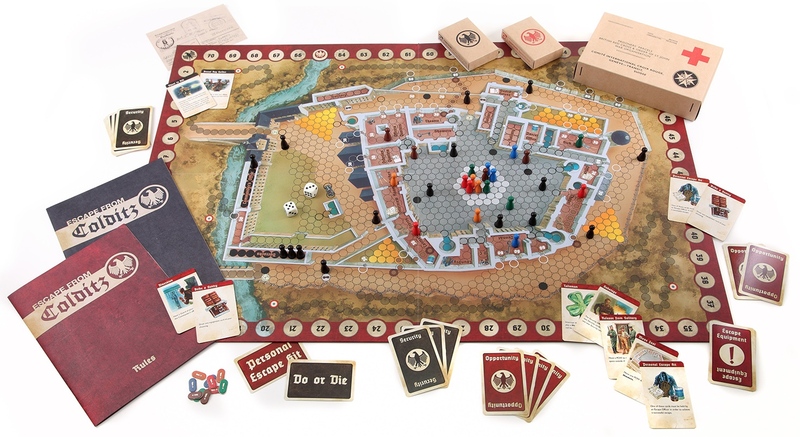 Escape From Colditz is a 1-vs-many semi-cooperative game where one player is the Security Officer of the German forces, and the others are Escape Officers for various nationalities or prisoners of war (POWs). Escape Officers try to acquire the equipment they need for a successful escape (rope, wire cutters, etc. ), while the Security Officer tries to hinder them by putting them in solitary confinement and consficating their equipment. Play lasts for a pre-determined length of time or number of rounds. If an Escape Officer can free a pre-determined number of POWs (usually 2) before then, they win. Otherwise the Security Officer wins. To celebrate the 75th anniversary of Major Pat Reid’s escape from Colditz Castleduring World War II, this is the definitive edition of an iconic game. Escape from Colditz been given a complete visual overhaul from renowned World War II artist Peter Dennis. Designed by Major Reid himself, the rules have been updated in consultation with co-designer Brian Degas. The game was co-designed by Major PR Reid, a British soldier who was one of the few to actually successfully escape from Colditz during the Second World War.